Authorities in the state of New Jersey said they have busted a lucrative mob-run sports gambling ring. 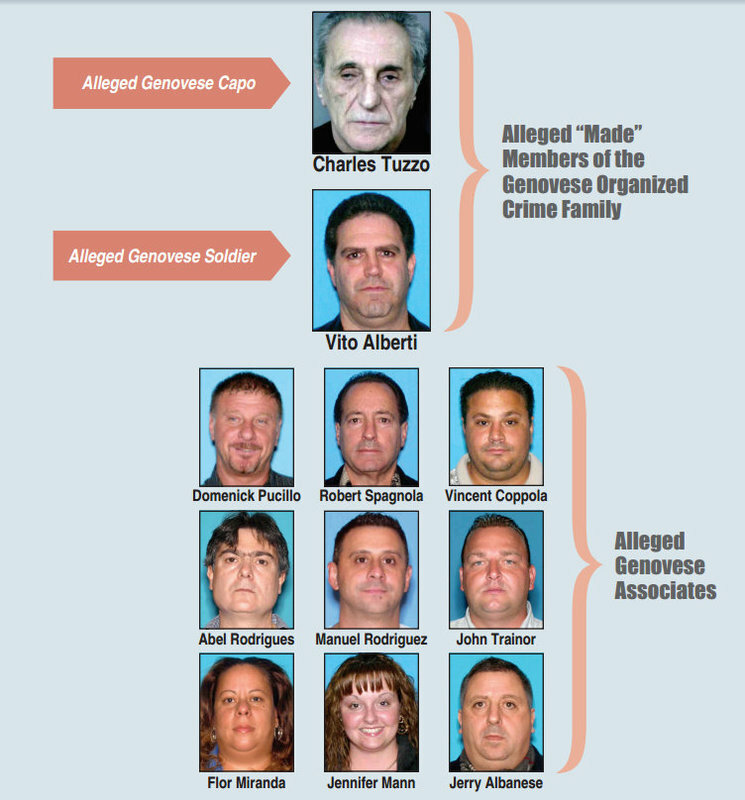 In total, 11 alleged members and associates of the Genovese crime family have been charged with “reaping millions in criminal profits” in New Jersey through loansharking, illegal check cashing, gambling and money laundering. The New Jersey attorney general’s office announced the charges on Tuesday. “We charge that this crew of the Genovese crime family was up to many of the Mafia’s old tricks in New Jersey, including loansharking and illegal gambling, to the tune of millions of dollars,” said Acting New Jersey Attorney General John Hoffman. Vincent P. Coppola, 37, of Union, N.J., son of imprisoned Genovese capo Michael Coppola, allegedly was part of a network of Genovese associates who ran a multi-million dollar illegal sports gambling enterprise in New Jersey that utilized an off-shore “wire room” in Costa Rica to process bets. Coppola allegedly was an “agent” who managed sub-agents or package holders, each of whom had a “package” of bettors under him. He allegedly supervised sub-agents John W. Trainor, 42, of Brick, N.J., and Jerry J. Albanese, 47, of Scotch Plains. Agents decide which bettors can open accounts and gamble using the enterprise’s website and toll-free phone number. They also dictate how much a bettor can gamble per game and per week, and monitor the action and balances of the packages they oversee. Eventually, Coppola allegedly gave Trainor and Albanese more complete control of the bettors in their packages. Coppola allegedly had four packages under him, including those of Trainor and Albanese. In a single year, in 2011, Coppola’s packages allegedly handled more than $1.7 million in bets, and Coppola, Trainor, Albanese and the Genovese crime family—through Alberti and Tuzzo—allegedly made more than $400,000 in profits. The case comes as the state of New Jersey is trying its hardest to debut legal sports gambling its casinos and racetracks. Gov. Chris Christie has said that he thinks by legalizing sports betting he can take it out of the so-called black market.